StP Beauregard Ferme, Camiers, Pas-De-Calais. K.V.A. D1 Hardelot to Merlimont. HQ for the 1st Artillery Regiment 149. 1 x observation Point (OP). 1 x Machinebunker (not found). 4 x Unterstands. 1 SK. 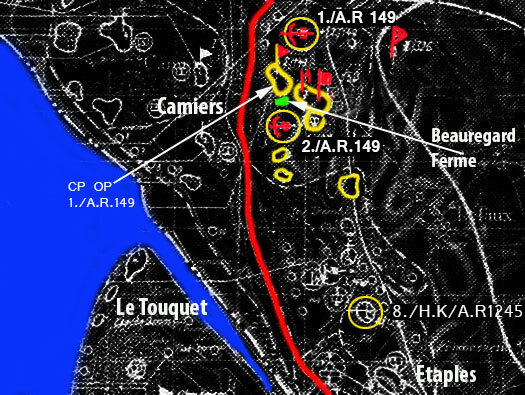 4 x Geschützstellung (open emplacements). Command post forÂ Stab 1st Artillery Regiment 149. 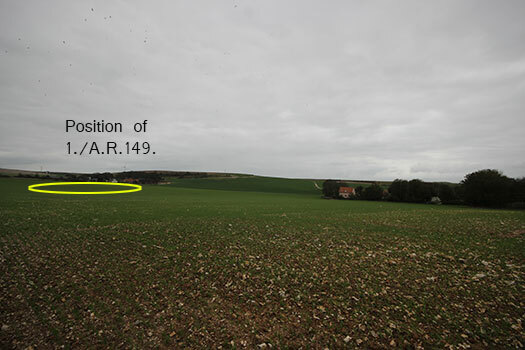 The maps red arrow does not line up with the correct place but the CP is located in the field to the north of the farm and the yellow road number D148E5. If you zoom in on the shape in the field you will see it quite clearly. The plan is not very easy to read. The red line is the railway. Red square - two Abri and one may have been a kitchen possibly in the 1./A.R.149 area? I have now dedicated a page for 1./A.R.149 you can see it by going to the main menu. 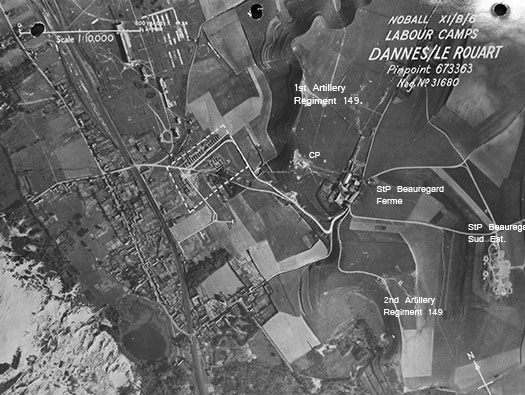 An RAF reconnaissance photo 23 September 1943. This specific reconnaissance flight seems to be looking for either a Todt workers camp or an army camp in the village of Carriers. 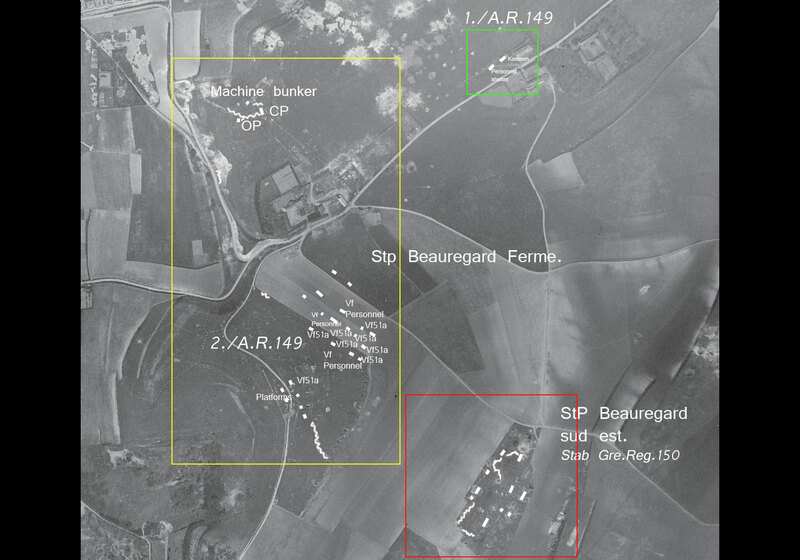 It also shows the OP & CP, two artillery positions and the white straight lines are burred sunken telephone cables. Cameras being fitted into a Spitfire. The layout of the area. The yellow oblong shows the area of StP Beauregard Ferne area. With the CP & OP in the north and in the south the position of the 2./A.R.149. [The layout of the battery is taken from a hand drawn plan from Dirk Peters, Thank you Dirk.] The green square is the battery position of 1./A.R.149. 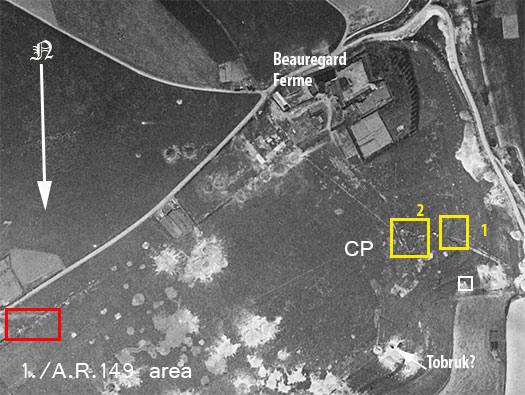 The red square is StP Beauregard sud est, the Stab. Gren. Reg. 150. 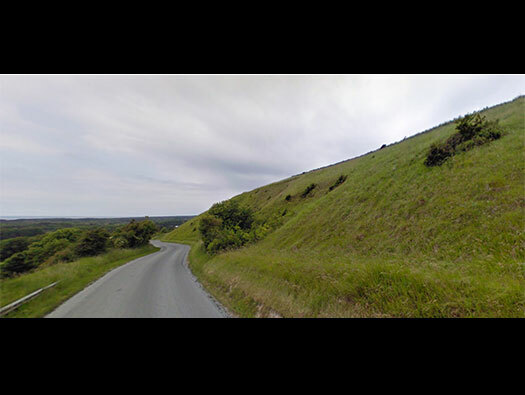 A bit of a sharp climb up the hill. The view is worth it. Observation. Command post forÂ Stab 1st Artillery Regiment 149. Observation slit at the front. Not a very strong bunker, there was a lot of heavy bombing in the area, a Canadian soldier was very impressed by the bombing of the Mont St Frieux area and said it was a carpet of bomb craters. The views from here are very far reaching if the grass had been cut. I did not find any command cables or aerial fittings? it could be that the floor was covered in earth brought in from years of ploughing the fields. Window and secondary escape hatch. Probably a small opening window and in an emergency you could crawl out. The second rear room and exit. The emergency escape hatch way. 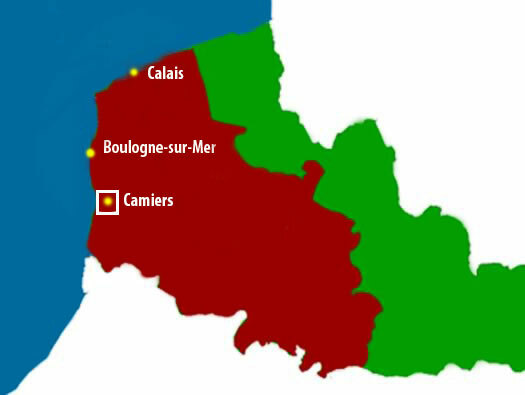 left: - La Touquet (StP Canche Sud). This side of the river: - (StP Canche Nord). In the foreground the railway running N/S, Camiers and Dannes. Over to the right and just out of shot The large complexes at Neufchâtel, Mont St Frieux. Set just behind Observation Post. This room was separated from the rest of the office with only a side outside door and a window and no access to the main offices. Command post for StabÂ 1st Artillery Regiment 149. To get into the rest of the building you fight your way along the back. View through the first window. Main office note the strengthened roof. A stove of some form sat on the large concrete block and the chimney went up the wall. A standard bunker stove but the one here could have come out of one of the local farm houses. Liberated is the word. The sun would have streamed in as it faces due south. The way out with steps up into the field. Looking back on the Command Post. The view with StP Mont St Frieux in the back ground. The entrance to another bunker. We did not enter this one as it was rather covered over. We do not know what it is. Looking south the views over to the farm and battery 2./A.R.149 was on the hill behind the trees. The battery was on the top of this hill. Looking back east of the artillery position of 1./A.R.149. Back down on the road D148 E5. In the bank we think these were trenches and possibly a machine gun position covering the road? The job of the battalions defence platoon. Looking back down the road. The trench is in the bushes.